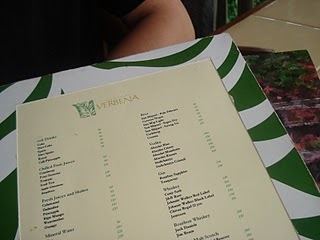 I’ve long been hearing of Verbena, but only from a very select few and these people aren’t even part of the foodie world. Though I was told the food was good, these people didn’t go into the details, so I thought it was just another pretty place. 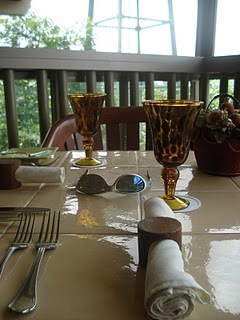 D and I went to Tagaytay wanting to go to a pretty place and what we found was not only pretty, but pretty awesome. Let me start by sharing how visually attractive the place is. Oh, it’s nothing spectacular or cute, but there’s just something about how things are fixed up that keeps my eyes open and want to take pictures of nonfood items. Then we check out the menu. Wow. Things aren’t cheap here (I know. I know. I should’ve checked out their online menu.) and I didn’t want to let D spend so much (We take turns treating each other out and my treat was uber…cheap. ), so I searched for the meals with the more reasonable prices. D, oblivious to my concerns, loudly proclaims that he is in the mood for Eggs Benedict. 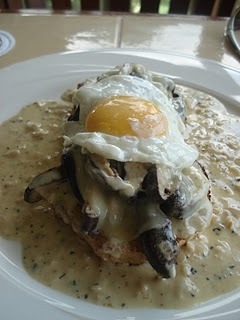 Before I can tell him that there was no such thing on the menu, the waiter comes to my rescue and recommends the Bavarian Mushroom Croute (Php280) which, claims the waiter, is similar to Eggs Benedict. When we tried it — oh my gasp — it was even better than our favorite Eggs Benedict! The eggs remained to be the superstars in this dish, but their flavors were coaxed and enhanced by this mushroom sauce that keeps you hanging and wanting more at every swallow you make. And did I mention the mushrooms? Oh my. The mushrooms were just SO fresh!!! “Panalo!” D couldn’t have said it better. 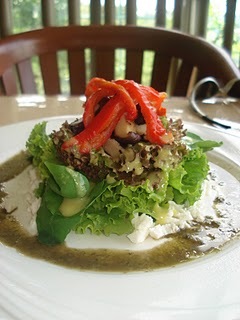 Next comes the Salad “Composee” (Php250). This one won’t go to my scrapbooks, but its roasted bell peppers will! They’re all I remember in this salad and wow, did they impress me! (1) Grilled Norwegian Salmon with Arugula Mushroom Salad – It was okay. I should’ve requested that my salmon be cooked medium rare. 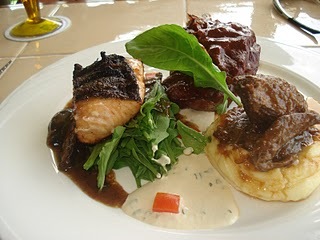 It was interesting though to taste salmon more like meat rather than fish. 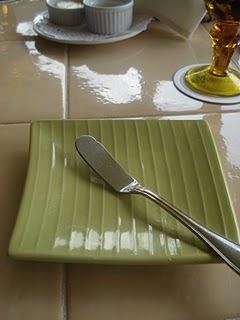 It had none of the fishy taste (lansa) at all, which is good because D doesn’t like that kind of fishy taste. 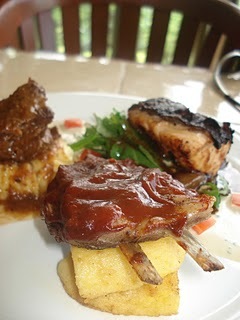 (2) BBQ Lamb Baby Back Ribs – This was delicious! I wish though that the lamb taste was more evident. (3) U.S. Beef Short Ribs Goulash – Now this is my favorite! Didn’t taste like my staple goulash favorite, but I was very happy with this version. With most goulash, it’s the blend of the sauce and the almost-shredded beef that gives you the punch. 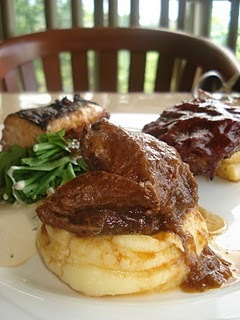 Verbena’s version holds back the sauce and allows the beef to show off its meaty delight. Guess they have to do this to point out the difference between U.S. Beef and some other beef. Verbena’s Sampler Plate are two firsts for me. First time that a restaurant can truly be proud of a sampler plate. First time that a sampler plate can feed two humonguous appetites! Long after we left, I couldn’t stop telling friends about Verbena. Know what they told me? I was the first foodie they know who gives the food details. Must be some secret pact somewhere. I know D and I will be back and for the next visits, no more guilt feelings, no more hesitation to let D (or even myself!) spend. It is money well spent. 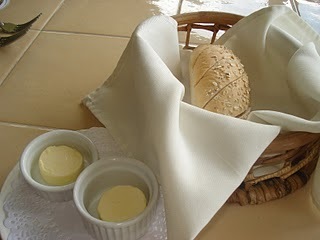 hey, nice blog you've got here...Too bad you didn't try the panna cotta...it's simply fantastic!!! I tried the Panna Cotta. And yes, it was nothing short of amazing. You had me at the mushroom croute! I'm a major eggs benedict fiend and I have my favorites around town too, and this their alternative to the eggs benedict sounds divine! Must go and eat there, have only been there once to check out the place but we didn't stay to eat. You know me, Katrina, basta road trip I'm in! It's time we check this place out ourselves. :) Basta after my freakin SBD ok. Thanks for all the reviews guys! Oh wow! I wish I were going with both of you! Do share what you ate and your comments, okay? Christine, you will LOVE that mushroom croute. I'm craving for it right now. Sigh.